Glue is a gelatinous adhesive substance used to form a surface attachment between discrete materials. Currently, there are five basic types of glue. Solvent glues comprise an adhesive base mixed with a chemical solvent that makes the glue spreadable; the glue dries as the solvent evaporates. Most solvents are flammable, and they evaporate quickly; toluene, a liquid hydrocarbon made from fossil fuels, is often used. Included in this category are glues sold as liquid solders and so-called contact cements. Water-based glues use water as a solvent instead of chemicals. They work slower than chemical solvent glues; however, they are not flammable. This category comprises such glues as white glue and powdered casein glue, made from milk protein and mixed at home or in the shop. Two part glues include epoxy and resorcinol, a crystalline phenol that can be synthesized or made from organic resins. One part contains the actual glue; the other part is a catalyst or hardener. Two part glue is very useful for working with metals (automobile dent filler is a two part glue) but must be mixed properly to work well. Animal hide glues are useful for woodworking and veneer work. Made from the hides as well as the bones and other portions of animals, the glue is sold either ready-made or as a powder or flake that can be mixed with water, heated, and applied hot. Cyanoacrylate glues, usually referred to as C.A.s, typify the newest and strongest of modern glues, which are made from synthetic polymers. A polymer is a complex molecule made up of smaller, simpler molecules (monomers) that attach to form repeating structural units. Once a polymeric reaction has been catalyzed, it can be difficult to halt: the natural impulse to form polymeric chains is very strong, as are the resulting molecular bonds—and the glues based upon them. In the home and office, small quantities of C.A.s are useful for an almost infinite number of repairs such as mending broken pottery, repairing joints, and even holding together split fingernails. In industry, C.A.s have become important in construction, medicine, and dentistry. Cyanoacrylate glues were discovered at a Kodak lab in 1951 when two chemists, Dr. Harry Coover and Dr. Fred Joyner, tried to insert a film of ethyl cyanoacrylate between two prisms of a refractometer to determine the degree to which it refracted, or bent, light passing through it. Though the first conclusion of Coover, Joyner, and the other members of the lab team was only that an expensive piece of laboratory equipment had been ruined, they soon realized that they had stumbled upon a new type of adhesive. Moving from a lab accident to a marketable product is not easy; Kodak did not begin selling the first cyanoacrylate glue, Eastman 910, until 1958 (the company no longer makes C.A. adhesives). Today, several companies make C.A. glues in a variety of formulations. Some large manufacturers operate research laboratories to respond to new demands for special formulations and to develop new and better C.A.s. The initial ingredient in super glue, ethyl cyanoacetate, is placed into a kettle with revolving blades and mixed with formaldehyde. The mixing triggers condensation, a chemical reaction that produces water; this water is then evaporated as the kettle is heated. When the water has evaporated, what remains in the kettle is the C.A. polymer. Next, the kettle is heated again, causing thermal cracking of the polymer and creating reactive monomers that separate out. When the finished glue is applied, these monomers recombine to form a bond. glue forms into microscopic hooks and eyes that grab onto each other, a sort of molecular velcro. With glues that work this way, the thicker the application, the more effective the bond. However, cyanoacrylate glues appear to bond differently. Current theory attributes the adhesive qualities of the cyanoacrylate polymer to the same electromagnetic force that holds all atoms together. Although a sizeable mass of one substance will electronically repel any other substance, two atoms of different substances placed in very close proximity will exert a mutually attractive force. Experiments with several substances have shown that two pieces of the same experimental material (gold, for example) can be made to adhere to each other without benefit of an added adhesive if forced into close proximity. This phenomenon explains why a thin film of C.A. glue works better than a thicker one. A thinner glue can be squeezed so close to the material it is bonding that the electromagnetic force takes over. A thicker film permits enough space between the materials it is bonding so that the molecules can repel one another, and the glue will consequently not hold as well. The chemicals necessary to form cyanoacrylate polymer include ethyl cyanoacetate, formaldehyde, nitrogen or some other nonreactive gas, free radical inhibitors, and base scavengers. Ethyl cyanoacetate comprises ethyl, a hydrocarbon radical (a radical is an atom or group of atoms that, because it contains an unpaired electron, is more likely to react with other atoms), cyanide, and acetate, an ester produced by mixing acetic acid with alcohol and removing the water. Formaldehyde is a colorless gas often used in the manufacture of synthetic resins. Nitrogen is an the most abundant gas in the earth's atmosphere, comprising 78 percent of by volume and occurring as well in all living tissue. Because it does not react with other substances, it is commonly used to buffer highly reactive elements that would otherwise engage in undesired reactions with contiguous substances. Free radical inhibitors and base scavengers both serve to remove substances that would otherwise sabotage the product. C.A.s are produced in heated kettles that can hold from a few gallons to several thousand gallons; the size depends upon the scale of the particular manufacturing operation. The separated monomers are piped to a second kette. In going from one vessel to the other, the monomers move through a series of cooling coils that allow them to become liquid. 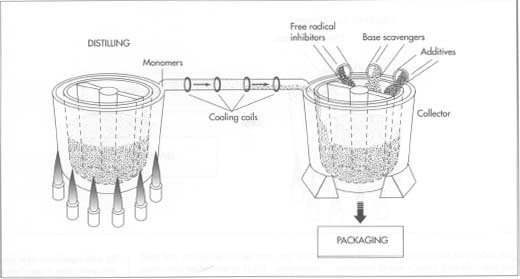 The contents of the second collecting container (the one holding the liquid monomers) are effectively the C.A. glue, although they still need to be proteed against curing. Various chemicals called free radical inhibitors and base scavengers are added to precipitate out impurities that would otherwise harden the mixture. After receiving any necessary additives, the glue is packaged accordingly. chemical reaction that produces water that is then evaporated as the kettle is heated. When the water has evaporated, what remains in the kettle is the C.A. polymer. 2 Because the C.A. will begin to cure, or harden, on contact with any moisture, the kettle space left empty by the evaporation of the water is filled with a nonreactive gas such as nitrogen. 3 Next, the kettle is heated to a temperature of approximately 305 degrees Fahrenheit (150 degrees Celsius). Heating the mixture causes thermal cracking of the polymer, creating reactive monomers (chemically, ethyl cyanoacrylate esters; with a slightly different process, methyl cyanoacrylate esters are possible) that will, when the finished glue is applied, recombine to form a bond. 4 Because the monomers are lighter than the polymer, they volatize upward and are piped out of the kettle into a second collector. The process is not unlike distilling, although the goal is a glue rather than an alcoholic beverage. In going from one vessel to the other, the monomers move through a series of cooling coils that allow them to become liquid. A second distilling might be performed for a high-quality product, and some manufacturers might even distill the monomers a third time. 5 The contents of the second collecting container (the one holding the liquid monomers) are effectively the C.A. glue, although they still need to be protected against curing. Various chemicals called free radical inhibitors and base scavengers are added to precipitate out impurities that would otherwise harden the mixture. Because the quantities of impurities and precipitates are small (measurable in nothing larger than parts per million), there is no need to remove them from the C.A. mixture. If particles of precipitate were visible, even under several hundred magnifications, it would be a sign of severe contamination, and the batch would be destroyed. 6 The C.A. glue can, at this point, receive any additives that the manufacturer wishes. These additives can control the viscosity of the C.A. (in fact, at least three different thicknesses are sold), or they can allow the glue to work on material types that earlier C.A.s could not. A thicker viscosity is desired when bonding is to be done on surfaces that don't meet very well; the thicker viscosity allows the glue to fill the empty spaces before it sets. Without other additives, C.A.s might need to be restricted to nonporous surfaces. With additives in the C.A. or with some surface preparation, the C.A. will work very well. C.A. technology is sufficiently mature that a manufacturer can meet a request from a customer for a C.A. that will bond almost any given pair of surfaces. 7 The C.A. can now be added to tubes using conventional, albeit humidity-free, techniques. Once a tube is filled, a top is fitted and crimped on, and the bottom of the tube is crimped closed. Because most metal tubes would react with the C.A., packaging tubes are usually made of a plastic material such as polyethylene, although aluminum tubes are possible. Once the C.A. is exposed to moisture or an alkaline, either in the air or on the surfaces being glued, the monomers will repolymerize and harden, forming a tremendously strong bond between the two substances. The reaction is total; the entire amount of C.A. that has been placed on the substances will polymerize. Careful quality control must be exercised if the product is to work as it is supposed to. Because the polymerization of monomers is a universal reaction (it spreads throughout the amount of glue put on a surface, so that by the time the reaction has ended there is no glue left unpolymerized), any flaw in any step of the manufacturing process can affect thousands of gallons of material. Tremendous emphasis is placed on the quality of chemicals and supplies coming into the plant. Ideally, all suppliers have approved quality control procedures to assure delivery of quality product to the plant. Although the manufacturing process is automatic, it is carefully monitored in the plant at all stages of operation. The duration of the mixing, the amount of mixture at each stage, and the temperature all need to be watched by operators ready to adjust the machines if necessary. The finished product also is tested before shipping. Most important is shear resistance, a measure of the force necessary to break the holding power of the glue. Measures of shear strength commonly reach several thousands of pounds of force per square inch. Lee, Lieng-Huang. Adhesive Bonding. Plenum Press, 1991. Packham, D. E., ed. Handbook of Adhesion. Longman Publishing Group, 1993. Skeist, Irving. Handbook of Adhesives. Van Nostrand Reinhold, 1977. Swezey, Kenneth M., updated by Robert Scharff. Workshop Formulas, Tips & Data. Sterling Publishing Co., 1989, pp. 194-212. "Which Glue for Which Job?" Consumer Reports. January, 1988, pp. 46-51. Hand, A. J. "What to Know About Super Glues," Consumers' Research. November, 1990, pp. 32, 40. Hand, A. J. "Secrets of the Superglues," Popular Science. February, 1989, pp. 82-84+. Sterling, Bruce. "Superglue." The Magazine of Fantasy and Science Fiction. June, 1993, p. 107.